There have been many soap operas, daytime talk shows, and reality shows, but none of them are quite like the original Divorce Court, which ran from 1985 to 1992 (this is not referring to the current reality show, Divorce Court, that airs on Fox.) When I was a senior in high school, I was allowed to leave campus when there was no class. With no Internet at the time, I went home in-between classes and watched TV. Even though the show aired during the daytime, many of the stories were risqué and probably wouldn’t have been aired on television if they had been acted out as opposed to discussed in court. The show brought up issues such as divorce, adultery, and abuse, but it also had to come up with wild, original ideas to keep things interesting and fresh. For example, on one episode, a man claimed he was under amnesia when he got married. On another episode, a couple had a German shepherd who had a trust, and on another episode, a woman gave up her son for adoption, then later found him and married him (without telling him of their biological relationship). In each show, actors played the spouses and the witnesses. The honorable Judge William B. Keene (a retired real life Judge) would preside over the cases and solve them in thirty minutes. Every episode would end with Judge Keene giving a sermon on love gone bad before rendering his verdict. For reasons I can’t explain, I was hooked. The plots were outrageous. The acting wasn’t Oscar caliber, but that just added to the spirit of the show. I continued watching the show as a freshman in college until the show went off the air in 1992. The show went back in 1999 as a reality show (meaning no actors) with Judge Lynn Toler, but it wasn’t the same and I didn’t watch it. I forgot about the show until one day I randomly typed “Divorce Court Judge William Keene” into YouTube and discovered a handful of episodes of the Divorce Court (Judge Keene era) I grew up with. (Any of those episodes on YouTube will give you a taste of what Divorce Court is like.) After reliving memories of watching Divorce Court in my youth, I felt obliged to write this next blog entry on a show that provided much entertainment and enjoyment. The cast is going to tell the story of the show’s beginning and end . . . and it is not the final story to tell. Not everyone was willing to talk about their time on Divorce Court. (The first actress I contacted through her business did not want to talk to me.) Some actors leave their appearance on the show off their résumé. But for all those people who would rather not remember their time on the show there are just as many people who are willing and eager to tell their story about their experiences. My hope is that people will feel comfortable talking to me after reading this blog and add more layers to the story of Divorce Court. If you appeared on the show or were affiliated with the show in any capacity and have a story to contribute, please contact me here . For now, this is the 1.0 version of the Divorce Court story. The first Divorce Court series began in 1957 and ran until 1967. It was then revived in 1985. Despite the fact that show was a soap opera and aimed at that specific audience, the show had some high names involved. Divorce Court was executive produced by Donald Kushner (producer of Tron) and Peter Locke (producer of The Hills Have Eyes, both the original (1977) and the remake (2006)). Kushner and Locke produced several films together, the most famous being Teen Wolf starring Michael J. Fox. Despite the many Divorce Court episodes they produced, the Kushner-Locke Company website does not mention any involvement with the show. Joan McCall: Working for them was okay. Let’s just say they were very strong. They wanted what they wanted when they wanted it. I understand it, because they were under their time pressures, but they were also less caring than they could have been. At one point during the whole thing, I had to sue them to get them to pay me for the time that I worked. They started badmouthing me, and they could not get any of the writers or any of the people I worked with to agree with them, so they had to give up. So that’s why I think of them as little bit strong and a little bit negative. But I really don’t hold any grudges against them. Other producers on the show include Esquire Jauchem, who founded the Boston Repertory Theatre, and the late Richard Glatzer, who wrote and directed Still Alice, a film that received critical acclaim, including Julianne Moore winning an Academy Award for Best Actress in 2014. Lee Gutenberg: Yes, I remember Richard. He was a real nice guy and we would speak often. Esquire was a good friend of Donald Kushner and a very nice guy. I seem to remember that he invented a lighting effect for stage productions. He might have also done lighting designs for night clubs. But despite those big names behind the camera, there was one key ingredient that was needed in front of the camera: Judge William B. Keene. 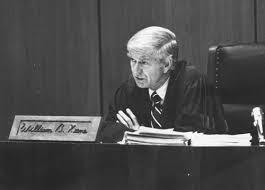 Judge Keene was a retired judge of the Los Angeles County Superior Court. He was originally issued to the trial of Charles Manson. Unlike many judges in TV and film, Judge Keene rarely use his gavel to keep order. When he had to scold someone, he never resorted to Judge Judy-type of verbal putdowns. His reprimands were to the point and stern. Judge Keene had a real life integrity that no amount of soap opera material could drown out. The cast had nothing but good things to say about Keene. LG: He’s a really good guy. He was being paid a lot of money for the show and then he was retired. He wasn’t practicing, so you know, he was good. He brought on as much integrity as he could bring on for a show like that. That’s just the way he was. Ellen Snortland: He was just a straight-shooting guy, and I think the likability factor was strong. People just trusted him and liked him. Pamela Hill: Bill Keene—very cool, nice, down-to-earth guy. I remember him being a nice gentleman. He was very professional, and he just seemed very staunch, which I’m sure that’s why he’s a judge. I don’t remember any drama. Glenda Chism Tamblyn: Judge Keene was a delightful person to be around. I remember Judge Keene to be a very patient fellow, but he did have his limits. I only shot one show a day, but he was there all day. They allowed about two hours to shoot an episode, so they would shoot maybe four episodes a day. I never saw him storm off the set or speak harshly to anyone. One afternoon, we sat in his dressing room area and ate lunch together. I think it was then that I learned that he had been the original trial judge for the Charles Manson case. He is just as soft-spoken in person as he is on the bench. It was always fun to see him laugh or crack up on set. The show initially had real lawyers who were playing lawyers and only actors played the spouses and witnesses. Jim Peck, a game show commentator of shows like The Joker’s Wild, played the courtroom reporter from 1985 to 1989. LG: For the first three seasons, there were only real attorneys. They would Taft-Hartley them, meaning, they got them the SAG (SAG stands for the Screen Actors Guild, a union for actors in movie and television) card and they were able to qualify for things like healthcare, as well as SAG minimum wages at the time. ES: A friend of mine was casting. Neil Elliot was a friend of mine from the acting cooperative community called Mastery of Acting and he knew I was a lawyer and also an actress. So he thought, "Oh boy, double-hitter." That’s how I got involved. It turned out to be a good fit because I have a strong sense of the absurd and my background is in theater. I loved live television. The lawyers would argue their case and Judge Keene would make his decision. Nobody on the show knew his decision until the ending. JMC: We didn’t write what he said, and we didn’t write his verdict. Judge Keene always got to do that himself. I guess he was just deciding from everything presented to him. He had his own license to make his own judgment about them. LG: He wanted to have the final say. Each act was timed—someone up in the booth was timing it—so the length of his judgment, the verdict, varied. Sometimes it would be three and a half minutes. Sometimes it would only be one minute and twenty-five seconds. No one influenced him on that. ES: We really didn't know what the outcome was going to be. Sometimes it would be a big surprise. Although most of the time, especially the lawyers, would see that one party was gonna prevail. It wasn't rocket science. As for the actors who were playing the spouses and witnesses . . .
LG: The show employed more SAG actors in the few weeks that we did the show than anyone else in Hollywood. All of the actors were SAG actors. They got SAG minimum. Divorce Court got a lot of people who were either breaking out, or people who were at the end of their career. I think SAG minimum at that time was $525, I'm not sure. You showed up, you got paid, and you walked away. It’s what they call a “strip show,” meaning, it’s just done really quickly. There wasn’t a lot of acting involved. The only thing you had to do is walk from your table to the witness stand, say a few lines and go back to your seat. The show ran like a well-oiled machine. There were five shows a week, each to air from Monday to Friday, so the shows had to be made constantly. Scripts had to be written, cases had to be filmed, and Judge Keene had to rendered his verdict. JMC: Our head writer would do research and come up with all of these cases that were actual cases tried in court. We would have the basis story, but we wouldn’t have many of the details because the details weren’t recorded, or if they were, we didn’t have them. We knew how the process worked, and we knew how they argued, so we built a whole scenario out of whatever we were given. Sometimes it was a page. I was used to turning out a lot of work for the soaps. I was just given a script to do, and when that was done, I’d get another one. They just give you the page and you go back to your little cubicle. I had a little office all by myself, and I would just sit there all day and write. This was before computers. I was doing it on the typewriter. I don’t know if you’ve ever done that, but it is really brutal sitting hunched over the typewriter all the time, but I managed. In a few months, I managed to do twenty-five scripts. LG: We also had no postproduction the time that I worked there, which means that everything was edited on tape. It was the closest thing to live TV I’d ever done. Everything was question and answer. If an actor had given an wrong answer, they would roll back the tape to the question. The first assistant director would countdown and give the people on the set time for the tape to come up to speed, and the actor got the right answer this time, so it seemed flawless. The music, audio, everything was done live. There was no postproduction except when they sent a tape out to for the broadcast standards to be applied. We had a rehearsal before every show. I think the first cast got to the stage at five a.m., rehearsed at six, and then at seven-thirty or eight we ran the first show. Then we’d take another hour-and-a-half break while they rehearsed the next show on the set. Then we’d go back and tape that. Then we’d take a lunch. Then we’d do another show. While we were eating lunch, they’d be rehearsing the next show. If everything went smoothly, we were sometimes doing shows every three hours. That’s fast. We did approximately 120 to 180 shows in a season. I worked on over seven hundred episodes, but I was only there until 1988. ES: To tell you the truth, I can't remember any of those cases. Sometimes I would do five in a row. We didn't learn the lines. We didn't memorize the cases. We just kind of got out there and did it. It was down-and-dirty TV, which I loved. It's fun. Despite the fast pace of knocking out episodes, that doesn’t mean there weren’t issues along the way. LG: Other times some shows would go four hours. People would not read the script. Some of the actors would come unprepared. They’d come high. You know, some of them just weren’t doing things right. They’d goof up their lines. Lee remembers an episode where he had to play the spouse. The producer said, “Sure.” With everything it would cover my medical expenses. I thought I’d be a witness or something; I didn’t know what was going on. Then the producer said, “You’re playing the husband. Here’s the script. I guess you read that.” I had forty-five minutes to read the script. I was thrown into wardrobe. They didn’t have anything that fit me. Most of the clothes I was wearing were held together with duct tape. It was really just a big joke. I mean, there are gag reels of the judge stopping in the middle of a scene, taking out a light meter (a light meter is an instrument that measures light. In TV, a light meter can determine the optimum light level for a scene. ), and throwing it in front of my face. I never thought they would air it. I could hear the director over the earphones and people were yelling, “Do you still think that you can do it?” After everything was said and done, I received about $1,800 in residuals and initial pay and stuff. After the initial three seasons (1985–1988), actors were brought in to play lawyers to cut down costs. LG: It was just getting harder and harder to find real attorneys who would give up their time for $1,000 a day when they could make or break that. ES: As long as I was being cast, I was down for it. On a rotating basis, I was cast. I was a recurring person, so they would not have made me a regular because then they would have had to pay me more, right? [Laughs]. But they were very, very, very frugal, which is a nice way to put it. Oh, here's a quote from Judge Keene. [Laughs]. He says, "I think the actors were better." He commented that sometimes the lawyers were very stiff in front of the cameras. Judge Keene would be the one constant on the show. There was a high turnover of the writers and production crew. JMC: [Back in 1985] I only worked for about seven months, and I did those twenty-five episodes in about seven months. Then we went on hiatus. It was a whole big thing because they wanted me to be the head writer, and I agreed to it, and then the head writer wanted to come back. She had a job that fell through at Disney and she wanted to come back. [Laughter]. I didn’t really go back after that whole thing started. LG: I had the medical story. The results of those tests I took resulted in me being diagnosed with multiple sclerosis. I basically got out of that whole business. I did a few pilots [pilot means a television show’s first episode] a couple of months later, but I just had to get out mainly due to physical needs. It was a really bad thing, but one of the better things that happened to me because I can’t see myself being in that industry today. By 1989, the initial people who worked on Divorce Court—the producers, production crew, and the lawyers—were gone. The show continued with Judge Keene, but there were new additions. Martha Smith, best known for playing Babs in Animal House, was the courtroom reporter, taking over for Jim Peck. Soap actors were now playing the lawyers. More scenes would take place outside of the courtroom. The show’s ratings had declined, so this was a revamp to compete with other daytime television. Click here to read the 1989 LA Times article that describes how Divorce Court was rebranding. Pamela Hill was a reporter and stenographer during the 1989 season. She talks about her time on the show. Pamela Hill: I had moved out here [to Los Angeles] and had signed up to do some extra work. I was acting and modeling back home. I got a call from one of the casting people. They said that they needed someone for the show court reporter and stenographer. I was only out here for about four months, so I went down to the interview and thought, “Oh my god. This is happening so fast.” It seemed a little bit more involved than the extra work. I thought, “Wow.” I remember sitting there and I put my hair up like a court reporter. I pretended I was typing on the stenograph machine—I think that’s what it’s called. I was just pretending even though nothing was there. I was just being very honest and kind of just showing that I could do that. I think they got a kick out of that, and then they said, “Are you dependable?” I said, “Yes, I am. I’m a Capricorn,” and then they laughed. Martha was having success from other shows, especially Animal House. She was funny and a very vivacious and lovely gal. There is a man named Craig Stepp whom I actually reconnected with. He was a lawyer on the show. He did a lot of commercials and television shows. There was another guy who played a lawyer, Stephen Parr; I think he was on All My Children. I remember Jill Whelan who played the Captain’s daughter on The Love Boat. It was fascinating to me to see a lot of the guest stars on the show, or people playing lawyers were people I had watched on either soap operas or on TV commercials. I do remember there were really long days. We shot at least a good ten- to twelve-hour day, give or take. I remember there were some pictures [laughs]. One of those pictures had myself and a couple people from the show who were just so tired that, we would be lying [laughs] out on the jury audience chairs just to kind of take a cat nap. I just remember we were conked out because the days were long. They shot Monday all week, Monday through Friday. When I was on in ’89, I think I started shooting in the beginning of September for at least a good two months, and it was five days a week. It was filmed in Valencia. At the time I didn’t have a car, but I was very fortunate that one of the guys—I think his name was Joe—was grand enough to pick me up from west LA and give me a ride every morning to Valencia, which was very nice because not having a car made it a little bit hard. I believe Joe was one of the camera operators. One morning Joe didn’t show up. So, I’m like, “Oh, my god. What am I going to do?” It’s Valencia. It’s quite far from LA. It’s probably at least a good hour or hour and a half away, and I didn’t know what to do. My roommate wasn’t available to take me, and I didn’t have a car. This was years ago and there wasn’t Uber. I only had so much left in my bank account—at the time I had traveler’s checks, [laughter] and I didn’t have a lot left, but when you’ve got to get to Valencia, you’re going to grab something and call a cab. I don’t think I’d ever called a cab before, so long story short, I grabbed my traveler’s check stash and called a cab. When we arrived, the cab driver told me it was $60, so I gave him what I had. I’m like, “Here, take this. This is all I have. I hope it it’s enough.” I honestly don’t remember, but I think it was enough. I was always early to set, but that day I was probably just more on time. I don’t think I ever told anyone on set that I had to take a cab to get there, but someone had found out. During one of the wrap parties, they gave me a remote control car—a kind of funny gag gift—that I think I still have in storage. Still struggling in the ratings, Divorce Court had to cut costs even lower. Once the biggest employer of the Screen Actors Guild, the show was now hiring nonunion actors to play not only spouses and witnesses but also lawyers. Glenda Chism Tamblyn was one of the actors who played an attorney on the Florida shoot (1990-1991). Glenda Chism Tamblyn: One of my agents, Patti Thomas, went into casting. She and Mel Johnson were the casting directors for Divorce Court. Mel cast Swamp Thing and I think Superboy at Universal, and maybe one of the Nickelodeon shows. At the time I was cast in Divorce Court, I was working at Universal Studios Florida in the post production live actor show (now known as Harry Potter World). Patti called me in to read. I got a callback and then was cast. In the beginning, I don't think they were considering having recurring attorneys. 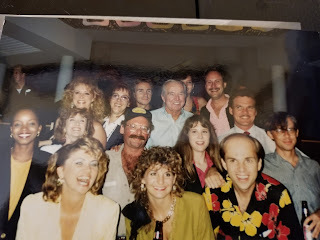 In fact, I recall Patti telling me that they had auditioned practically every actor in central Florida and only saw a few people who would make good attorneys. I was very excited and petrified to learn they were going to use the attorneys on more than one show. I ended up shooting nine altogether, which was one more than anyone else. I think there were maybe eight or nine of us actor-attorneys at the end. They started out with more, but a couple of people dropped out because of the issues with SAG. The Divorce Court shoot was non-union. I was in Actors Equity at the time and should have passed, but I was determined to do the shoot for the experience. Divorce Court was shot on the stage at Disney-MGM and the first day I drove onto the lot, there were protestors with signs at the entrance. SAG was so ticked off; they ran away to a Right to Work (for less) State. Florida was serious about attracting production into the state, especially into Orlando. I don't remember that the picketing lasted very long, maybe for a week. Summer was starting with a vengeance in Florida at that time. I believe we shot either in late May into June or throughout June. The directors used aliases for fear of work repercussions with the unions. They wanted the attorneys to use their real names, but I'm too much of a stage performer to do that; plus, I really wanted to hedge my bets with SAG and I thought my pseudonym, Ann Montgomery, sounded much more lawyerly. I did have to "explain" myself when I got my SAG card for playing Macaulay Culkin’s mother in My Girl! Judge Keene got into trouble with SAG for being on the non-union shoot, but the production company paid his fine. I think it was in the neighborhood of $10,000. Some of the actors who were playing spouses or witnesses would also play spouses or witnesses in other court cases. GCT: Yes, they had a two-show limit for the actors to play major characters. Along with Judge Keene, a few other things stayed consistent on the show. For example, no one knew what his ruling would be on the show. GCT: I am a bit foggy on whether or not we got the rulings in the scripts, but the uncertainty could come from the fact that the judge could rule any which way he wanted to regardless of what the script called for. If he felt the case wasn't strong enough or proven, then he had perfect leeway to rule as he saw fit. I think there might have been a few scripts where no one knew how the judge would rule, but I couldn't say for certain. As for the objections and all the lawyer speak, that was most certainly in the script. There was one episode—I think it was the last one we shot—that the producer wasn't too happy with, and so he gave it to me and my "client" who was someone I worked with at Universal Studios Florida, and together we all sat down at the table and reworked the ending. I think we still lost the case, but it was really fun, not to mention challenging, to be able to have such input. As with any show, there are always a few hiccups. The Florida Judge Keene Divorce Court only lasted one season. GCT: The end of the run was bittersweet. All of the attorneys that I knew were aware of when our last day would be, as the show had definite start and end dates from the beginning. Since Bruce McKay, (the producer of the Florida Divorce Court shoot) liked me, they scheduled one of my episodes to be the very last one shot. I seem to recall they scheduled the whole day's shoots with their favorite attorneys. It felt very much like coming to the end of the run of a play with the inevitable closing date looming on the calendar. At least with live theater there's always a chance—albeit slim—of extending another weekend. That's just not the case in film and TV. If there is an extension, it's a costly thing that nobody is happy about. I always knew that I would be shooting eight episodes, two a week. Then they gave me the additional ninth episode because of the reshoot. The show would have an end of season party, but it would end with some tragedy. GCT: The wrap party that evening was at Disney somewhere near the edge of the MGM property. They had set up an area with finger foods and an open bar. It started around five or six and went until around eight. Then we were off on our own to roam about the park. A few of us stuck together and then went our separate ways for a bit, but then rendezvoused at another bar on the property. I saw two of the attorneys, one of whom was Dan Parson. He was the other attorney who worked at Universal Studios Florida in the Horror Makeup Show. We would often get together and yack about Divorce Court at work. The funny thing about Dan was that he was a straight-laced Church of Christ guy, no smoking or drinking. But at the Divorce Court wrap party, he was knocking back drinks and bummed cigarettes off me. As a disclaimer, I am not a smoker, but back then I allowed myself one pack a year, and I only smoked one with Toni whenever we hung out behind the sound stages. I still had a couple of my "allowance" left. Dan and "Buttonhead" (the crew's nickname for another attorney who lived near Dan) were hanging out at the bar, and by that time Dan was really toasted. He was hanging on me and saying how he was gonna go to California—he was born there, so he called it "home"—to pursue his career. I wrote it off as so much drunken bluster, but evidently he had been talking about it a lot with coworkers. I left the bar not too long after arriving, ran into Bruce and spoke a little bit, and then I went on home. That was a Wednesday; I had the next day off, so I didn't get back to Universal Studios Florida until Friday. Not long after I got to work, the call went out that Dan was missing from makeup and he had missed the day before too. My knees went out from underneath me, and I told the gang that Dan had been really drunk the last time I saw him. I called Buttonhead, who went over to Dan’s house but Dan wasn't home and his car was missing. I thought that maybe he was on his way out west, so I called Bruce in Los Angeles and told him the situation. Bruce hadn't heard from him but told me that he would keep us informed if he did. On Sunday morning, a body was spotted by a hot-air balloonist, floating in a drainage ditch at Disney. Sure enough, it was Dan. Apparently, he had tried to drive home, got lost in the backroad swampy area, ran his car off the road into a ditch, and drowned. It was very, very sad. The funny thing about Dan was how competitive he was. After the first week, some of the hotshot actors decided to see who could shoot his episode the fastest. I don't think I knew about this until several shoots into the season. Dan ended up having the fastest time, and when I asked him about it, he confided that it was because he kept index cards in his pocket and would look down at them when the cameras weren't on him. Cheater! The show continued for one more season without Judge Keene. A different judge sat on with nonunion actors playing lawyers, spouses, and witnesses. It wasn’t the same without Keene. The eighties’ era of Divorce Court was over. LG: Judge Keene would call me and say, “You know, we were so close with everybody, but you’re the only one who ever calls me.” He’d ask me what the producers were up to. Nobody on the show. He wouldn’t know anything that was going on. That’s just the nature of that business, you know? I have another friend who had that same thing happen and he said the same thing. He said, “After all of these relationships I don’t hear from anybody.” That’s the sad part. Reflecting back . . .
PH: It was really cool. I got a write-up article in my local paper in Cincinnati and I still have it framed. It says, “Making it in LA,” and I’m in my dress in the court with the steno in front of me. I got my SAG card from Divorce Court. Until this day, I still get a residual, and sometimes it’s for a dime [laughs]. ES: Ahead of its time. Heteronormative marriage was what we did, right? And so women got cast [laughs]. I would guess the show was one of the biggest employers of women in the Screen Actors Guild. And [laughs] I still have people stare at me in grocery stores and think they know me from something. I'll say, "Well, did you watch Divorce Court?" And they'll go, "Yes!" GCT: My feelings about the show "evolved,” naturally! I still don't consider it Emmy-worthy TV, but it does/did serve a purpose. As an actor, I'm always in favor of anything that puts a performer to work just so long as there isn't any underhanded exploitation. Reasonable hours, fair pay, professional treatment on set and off . . . those were all present on the Divorce Court set, and I am very thankful for that. I thought some of the episodes were a bit on the cheesy side, but then we all knew it was "made for TV,” and a certain amount of cheese was needed. In fact, the more seriously you took the cheese, the better! Afternoon audiences really dug that stuff. Those four weeks on Divorce Court were some of the best of my life, personally and professionally. I met some of the most wonderful people in the area and we remained friends for a long time afterwards. Crews disperse, so it was very hard to keep track of those folks, but they were so much fun. I really came to appreciate and sit in awe of their skill. Technically speaking, my confidence as an actor grew by leaps and bounds. Memorizing lines became easier and easier. I was much more able to work in front of a camera without self-consciousness. The skills that grew from shooting that show have stood me well. Oddly enough, I had to leave the Divorce Court credit off my résumé for a very long time. I had been told by agents and others in the business out here that I wouldn't be taken seriously with that credit. It's hard to believe, since most actors hardly ever get the experience of a recurring role on a four-camera floor shoot. It just goes to prove the number-one rule of Hollywood: nobody knows anything.